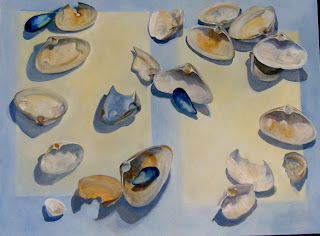 I added 6 mussel shells, but only three remain . Chuck, your lost and found edges, composition and negative space is great. A real hit. Love the composition of this one! Your eye just keeps going around and around. It's almost musical! Yep, this one's a winner. I'm with Paul, it's a cool composition. ..you made my day with your reaction Paul, I often think of musical connotations when composing these type of paintings!